If you are planning on travelling to Victoria from the mainland, you can catch the ferry to Vancouver Island from Tsawwassen to Swartz Bay. Swartz Bay is in Sidney and it happens to be a wonderful town to check out. It's close to the water, it walkable and there are a few vegan places to check out such as Fish on Fifth. It's not a vegan place but they have a vegan menu which includes a vegan big mac. It's also close to the famous Butchart Gardens so you could stay in Sidney if you are planning a visit to the gardens. Victoria is the Capital of British Columbia and the largest city on Vancouver Island. It's full of cool buildings and is home of Canada's oldest Chinatown. It has the best weather of any place in Canada. It seems like the sun is always shining and the weather is mild. The summers aren't too hot and the winters aren't very cold. When it does snow the city shuts down because it doesn't happen all that often. The downtown is walkable but it's a big enough city that there is lots of stuff to do. Victoria doesn't have the big stadiums that Vancouver has but they do have a good number of concerts and festivals such as Rifflandia and Ska Fest. You can also check out our Ultimate Vegan Guide to Victoria, BC for more information on where to eat. The city of totems is a great place to learn about the Cowichan First Nations at the Quw'utsun' Cultural and Conference Centre. It is also home to the best vegetarian cafe on the island called the Duncan Garage. There are many vegan options available there. There is also a vegan cafe called Cafe La Vie and Power House Living Foods. Power House is a chain of raw vegan restaurants on the island. This is a very small town that is known for its murals. They are all over the little town and it's worth a visit to check them out. Another attraction is the Chemainus dinner theatre but we don't know how vegan friendly the buffet is at the dinner theatre. It does say on their website that you can contact them and give them advanced notice and they will try their best to accommodate any special diets. There is also a health food store around the corner that sells vegan treats, in case you get hungry. This is nice little town right by the ocean with a great big park next to the beach. It's a great place for a picnic. They are also known for their long running Paradise Mini Golf and Fun Park which has two different courses. One course is pirate themed and another has houses and windmills. There is another mini golf in Parksville called Riptide Lagoon. For vegan food there is Lefty's which is not a vegan place but they have some vegan options. This is a great Vancouver Island tourist destination. It's a small town right near Pacific Rim National Park and Long Beach. You can surf here all year long. It is really cold surfing all year long and you have to wear a full body wetsuit with a hood and gloves. Aside from surfing there are plenty of places to hike in the park on the beach and on trails in the forest. There are opportunities to go whale watching in Tofino too. If you are looking for food you can get a vegan burrito from Tacofino. It's not a vegan place but they have a vegan burrito which tastes great. It's a food truck. It's known as the Hub City being mid island. There are lots of things to see and do in Nanaimo, especially if you like outdoor activities. There are lots of parks for hikes, sea kayaking, you can visit Newcastle Island, walk around downtown, and there is a ton of shopping. At one point Nanaimo had the most shopping per capita in Canada. This might not be the case anymore but Nanaimo has way more retail space than you'd expect from a city of 90,000. 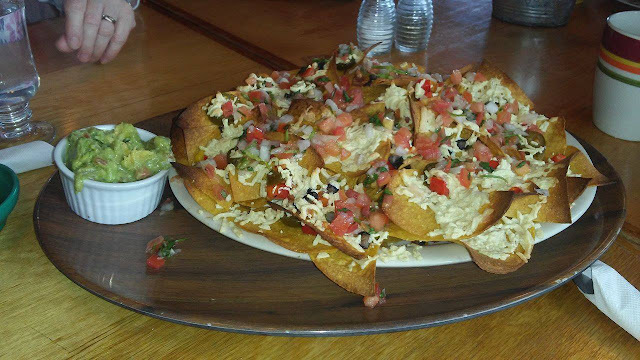 Go to Baby Salsa for their vegan Nachos if you're looking for a delicious meal. You can also check out our Vegan Delights in Nanaimo BC for more information on what to eat. You might be better off packing your own vegan food when visiting Telegraph Cove but there isn't a better place on the island to visit to see some Orca whales. It is an incredibly scenic part of the island with great opportunities for kayaking adventures and whale watching. You'll probably see some black bears as well. Hopefully from a safe distance. Close by Hanson Island is worth a paddle to in your kayak. There is a lot to explore. Telegraph Cove has a pub but vegan options there might be a little slim. There aren't many food options period since it's such a small town so packing some food from the grocery store is a good way to go. 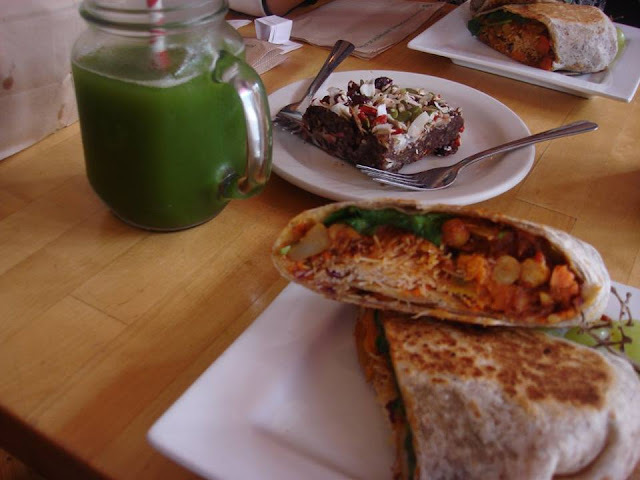 Rawthentic is another local chain of raw vegan eateries on Vancouver Island. 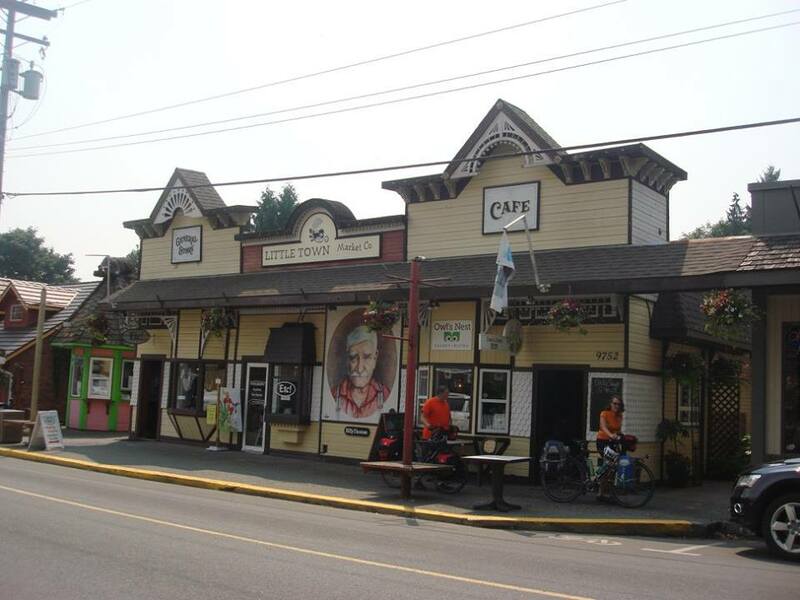 They used to have a location in Qualicum Beach that we would often go to but now they have a location in Courtney. Courtney is a nice little town and it is in close proximity to the Ski Resort Mt Washington. For anyone looking to Ski or Snowboard, Mt Washington is a great place to check out and why not stop by Courtney for some raw vegan food before and after. This is a raw vegan pizza we got there back at their old Qualicum Beach location. If you are looking for more of a junk food choice for lunch, try and catch the Bandwagon(A food truck) and try their vegan reuben sandwich or maybe their poutine. 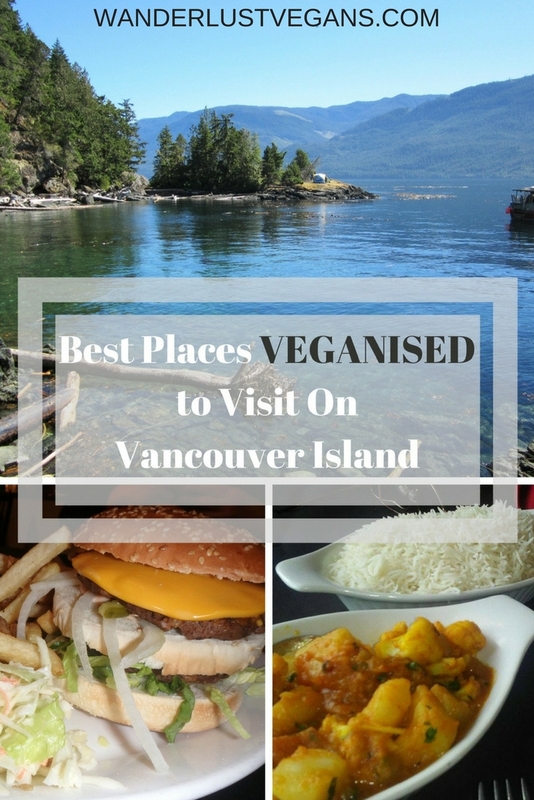 These are the best places to visit on Vancouver Island and vegan food can be found in almost all these places so don't you worry about vegan travel on Vancouver Island. Go to Vancouver Island, explore and eat lots of vegan food. If you're coming over to Vancouver Island from Vancouver then check out our Vegan Guide to Vancouver BC. Safe travels. Next time I'm on the Island I'm definitely going to check out Fish On Fifth! Their vegan menu is getting better every day! Yes! Vegan Hippie Chick Cafe in Victoria BC is a wonderful treat!